This was a special broadcast on WUG Channel, where they showed an episode of the Wake Up Girls TV anime. The hosts were Mayu, Airi, and Yoshino. For the opening drawing, each seiyuu drew a character that wasn't their own character. 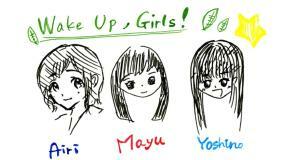 Airi drew Mayu, Mayu drew Yoshino, and Yoshino drew Airi. 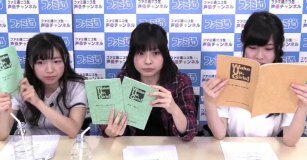 In the first half, they pulled topics out of a box, and talked about the past of Wake Up Girls. At around the 45 minute mark, they started showing the anime, episode 1. They brought the origjnal scripts and watched while looking at the scripts. During the anime, they showed the anime on the screen, and had a little window on the lower right corner for the seiyuu. They showed episodes 2 and 3 in the members only broadcast.